Where Next for the Islanders? After a weekend with no hockey, news has emerged that the owners of Brooklyn’s Barclays Center are looking to part way with the New York Islanders. Neither party has commented on the situation, but several sources have reported the story, and that’s good enough for some wild internet speculation. Whatever the truth is, the Islanders’ tenure in Brooklyn has been dogged with controversy. Players hate the ice, and fans can’t see the action thanks to restricted sight lines. The building was primarily designed for the Brooklyn Nets so hockey suffers. Attendance is down and the team is struggling. The Center’s financial projections don’t show the Islanders contributing after the 2018/19 season so expect the team to start looking for alternative digs soon. So where does the team go? How about back to the Nassau Coliseum? After the Islanders left, the Coliseum closed for renovations which are due to finish early this year. The Coliseum will maintain its ice surface but capacity will be reduced to around 13,000. The Islanders’ attendance may be dwindling, but 13,000 seats is too few for an NHL arena. This likely won’t happen. What’s more likely is that the Isles will build a new arena. There’s been talk of a new arena for months, last year there were rumors about a potential new arena in Queens near Citi Field or in Belmont. 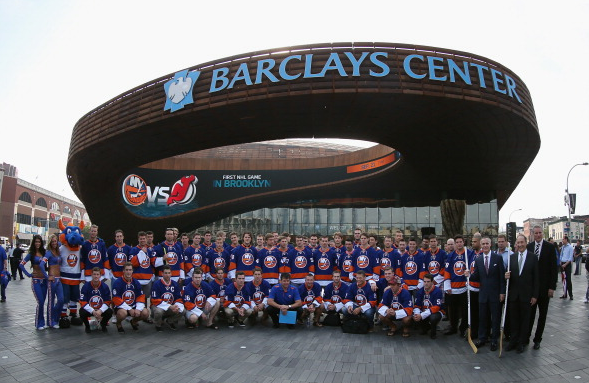 The Barclays Center took two years to build, so the Islanders should get on with it. If the team does build new, they could at least put the scoreboard in the right place. Sharing an arena is a possibility but it’s not very likely, but the New York Rangers have shared Madison Square Garden before, albeit a grim experience for the other team. This may be a temporary fix should a new arena not be possible, if so then local derbies will be a lot of fun. There’s an argument for relocating the Islanders. How many teams does New York actually need? In episode 116 Carl and Joel mentioned that Quebec would quite like an NHL team again. How about Seattle? There was an attempt to buy the Coyotes a few years ago but that fell through. Houston and Kansas City are also contenders. I’ve no clue if there’s a market in Mexico, but I’m sure Bettman can find a way to make money out of it if he ever leaves his relocation cloud of denial. A possible option is merging the team. Something that hasn’t happened in the NHL since the North Stars merged with the Barons in 1978. Presumably by the time the Islanders’ run in Brooklyn comes to an end, the Vegas Golden Knights will be struggling. So a merge might be on the books there. The Golden Islanders? This also applies to the Arizona Coyotes. Maybe all three if things get really serious. The New York Golden Coyotes. Where do you think the Islanders will end up? Comment below or join in the conversation on twitter. Next Post: Bruins and Bolts: One will win, will the other topple?